When my child does something that upsets or hurts another child, I want him to apologize. He may apologize but often is resistant, and it ends up in a big argument between us. How can we instill a sense of empathy for others and encourage apologies? What you are describing is a forced apology. If you are a parent who suggests to your child that they apologize and then they do, that is not forced. Forced apologies happen in one of two ways. Either the child is angry and resists having to apologize or the child is embarrassed and hesitant to apologize. In both cases, the child’s own negative emotions often get in the way of developing a sense of empathy. If your child is angry and not feeling sorry about what happened and you force the apology, the result is predictable. Your angry child likely will storm over to the other, bark “SORRY!” and leave abruptly. Rather than teaching your child to feel empathy, this situation seems to provoke feelings in the opposite direction. Your child may actually resent the other child more for his role in this interaction. Your child also learns that saying sorry, even if he doesn’t mean it, is enough to fix a wrongdoing. If your child is embarrassed by the idea of having to apologize but is forced to do so, the result differs but is just as predictable. With a push, your child may slowly approach the other child and then quietly say “sorry,” while fighting back tears. Empathy requires the child to focus on the thoughts and feeling of another. When a child is embarrassed, he is thinking mostly of himself which inhibits the development of empathy. Rather than force an apology from an angry or embarrassed child, you will have more success building a sense of empathy and teaching the language of sincere apologies through modeling. In the case of anger, take your child with you and say something like, “I am so sorry he did that. I would like to make it better.” Here, the parent is speaking for himself. The parent is sorry, the child is not. In the case of embarrassment, take your child with you and say something like, “He is so sorry. He would like to make it better.” The child actually is sorry, just reluctant to address it. Your child will have the benefit of hearing a sincere apology and optimally will be able to focus on the feelings of the other child rather than his own. On the opposite end of this continuum, some children readily apologize just to be finished with the conflict. I have heard my own seven year-old saying, “Sorry, sorry, please don’t tell mom, sorry!” while reaching to take a toy out of her sister’s hand. 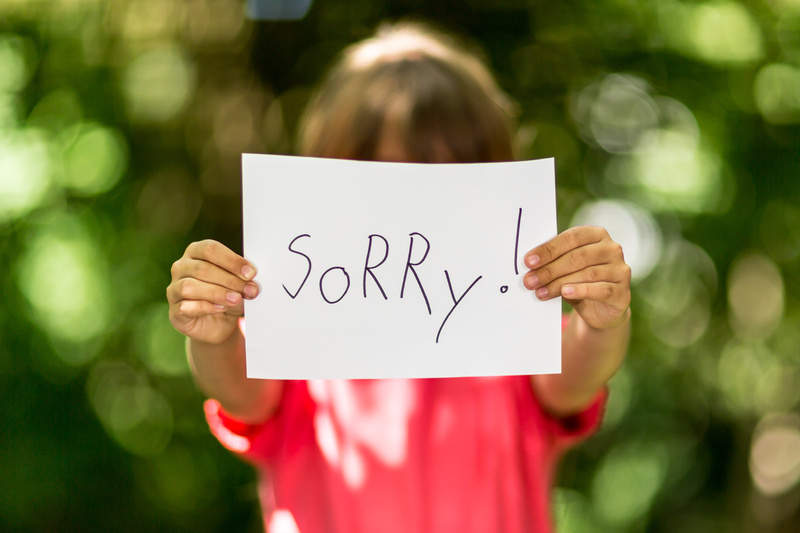 Here, a way to shape true apologies is to teach children to feel it, say it and fix it. This requires teaching children to focus on their feelings of remorse and recognizing when they should apologize. It often requires modeling the language of sincere apologies. This idea adds the idea of then teaching children to take some action or make some amends.